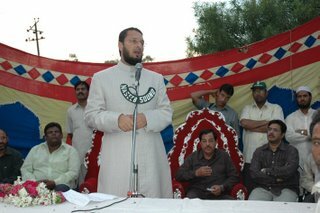 Majlis e Ittehadul Muslimeen MP Asaduddin Owaisi in Hyderabad. Speaker Sir the President has rightly said that in the first General Election of this Millennium the people have rejected the forces of divisviness and intolerance.Mr Manmohan Singh after taking being sworn in as PM said this is a mandate for change for strengthening the secular foundation of our Republic. Sir whatever BJP & Allies may say the 2004 Elections are a watershed in Indian Parliamentary History .People gave a Positivemandate to the Congress,& their Allies as well the Left parties & other Secular parties.Minorities were with the dominant & Secular Minded sections of the Majority Community in voting against the BJP & it pseudo secular allies in the NDA.The TDP debacle in AP is a clear example of how the BJP & NDA allies bore the brunt of voters anger against their misrule, divisive agenda,and their Anti Minority policies in State after State ,Minorities voted enbloc for the Secular Parties ,Left parties & other Secular alternative,whether it is TDP,Trinamul,JD<> all of them Hve paid the price for their alliance and support and sharing power with BJP .In AP TDP in its Mahanadu talked of snapping ties with BJP,leaders of TDP took CBN to task for continuing alliance with BJP even after Gujarat Carnage thereby totaling alienating the Minorities.Sir whether it was Telangana which trhe BJP once considered as its stronghold or the Coastal Andhra & Rayalseema minorities got alarmed by the spurt in the activities of the Sangh Parivar ,particularly the frequent visits of Singhal,Tagodia.The minorities joined forces with the Secular Sectiond of the society to deal a Crushing blow to TDP & BJP .Sir in 1984 BJP got 2 seats all ,over the country one of those 2 MPs came from AP.This time the BJP has drawn a Blank 7 its strength in AP Assembly has come down to 2 MLAS. The opposition parties allege that it is a fractured mandate ? Sir the Nda strength has been rerduced to 185 which is only one third BJP & it Pseudo Secular Allies and got only 35% of votes,whereas the Non NDA parties ie Secular Parties got TWO THIRD of the seats .This Has been the most decisive Election which has determined in clear terms the Direction Country should take. 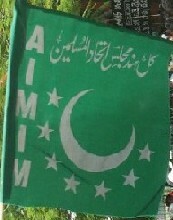 The previous Government used slogans like INDIA SHINING,.THE leader of opposition confesse now after his party humiliating defeat that these slogans didn’t work.where as before Elections he was the one had given this slogan after seeing it a Raymonds ad ,But the common man knew that India Shining campaign was a false propaganda .Feel Good factor of Economy was a cruel joke played on the poor and helpless farmers in the country.The fact that India Shining & Feel Good campaign failed became obvious when the Then Dpm decided to embark on a Yatra which was an utter failure ,it had no response from public,it confirmed BJP worst fears of lack of support .Yhey then realised that they have a last chance to whip up a frenzy by launching a vitriolic attack on Sonia Gandhi.The day they launched this vicious personalized attack campaign on that very day the they admitted that Sonia Gandhi had popularity & SHE was going to get a mandate to be the next PM of INDIA . Sir till the last minute Hitech Naidu was claiming that he will win & retain power because of mis leading reports given to him by his coteries ,Mr Vajpayee was also taken for a ride by the BJP coterie which made him believe that the party could compensate the likely losses in AP by winning 30 seats in UP but the final figure came to only 11 seats.Sir very soon we are going to see BJP being deserted by its allies TDP blames BJP & claims that by not removing MODI ,it was the main cause OF ALIENATION of Muslims from TDP .Sir the fact remains that CBN did initially demand rermoval of Modi but bargained on the Dead bodies of Gujrati Muslims but claiming 15 lakh ton of rice under Drought relief but blames BJP today to distance himself from Saffron Brigade. Sir we have the about turn of Jayalalitha in dumping the Hindutva Agenda ,she might be followed by the lady from West Bengal,it looks like every ally is jumping from the sinking ship. BJP will never come back to power unless they totally reform themselves, give up there divisive Agenda. Speaker Sir I would like to bring to the notice of this House that Muslims can differentiate between friends and foes appeals were made by Imams of Mosques to vote for BJP but Muslims knew who to vote , the biggest fraud was played by the so called SENSIBLE CITIZEN ,when asked why this sensible Citizen was endorsing BJP the reply was BJP secular. The surprising thing that after staying in one party for 30 long years enjoying all the positions and suddently endorsing that BJP is secure it reminds me of a famous of Hyderabadi saying Basi Kadi of Ubal Ayya. Mr. Speaker Sir, the fabric of secularism is an urgent need of repair and correction. We must remind ourselves that Sang parivar has only been stopped from coming into power. We have to ensure that these forces of hatered are completely annihilated . In para 24 there is a mention that the govt. will enact a model law to deal with communal violence. My demand over here this law must be made compulsory for all the States to adopt it The President has rightly mentioned that the Gujarat carnage was gruesome. Speaker Sir, through you I would like to the notice of the Prime Minister that Sir, in last five years Muslim minorities have troubled day in and day out. There are many tears in many eyes now is the time Mr. Prime Minister to wipe those tears especially from the Gujarati Muslims who have lost everything. What they want is a govt. who can punish the guilty, who can rehabilitate them they want this UPA govt. to ensure safety for their lives and a guarantee that in future the modern day Neros do not create another Gujarat in any part of our country . I demand that the Union Government should order an inquiry through Ministry of Home Affairs that why is it POTA has been applied only to Muslims in Gujarat, I also demand that the Prime Minister should also order a fresh inquiry into the killing of Hiren Pandya. 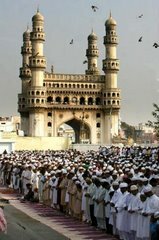 Mr. Speaker Sir, 19 Muslim youths from Andhra hav e been arrested for the murder of Hiran Pandya. Sir, isn’t surprising that this killing takes place in Gujarat and the father of late Hiran Pandya contest against the leader of Opposition claiming that the CM of Gujarat is responsible for his son’s death and what we see AP youths have been arrested under POTA for this murder. The Central Investigating Agencies unfortunately became a tool in the hands of Hindutwa forces to settle their scores. The reason Hyderabad and AP were targeted because this is one place where there is high level of political consciousness among the Muslim masses and that is why Hyderabad is being targeted by the Sangh Parivar. Sir, the Govt. must provide constitutional status to the miniorities Commission. Sir. In para 25 it says I quote “On Ayodhya issue” I would like to lodge my strong protest on the mention of this world , whereas the whole country including the Courts of Justice mention it as Babri Masjid case or Babri Masjid demolitrion case. In future I request that this issue should be called Babri Masjid demolition case. We welcome the stand taken by the govt. that they will wait for the court verdict. I would like to clarify that there will be no negotiations with any one how mighty or any Excellency comes forward with an offer of talks. Muslims of India will not negotiate but I would like to reiterate what has been said in the past that we will abide by the decision of Courts. I also welcome the govt.’s decision to repeal POTA. My request to Hon. Prime Minister through you Sir people who have been charged under POTA and whose cases are pending after the act is repealed they should also be discharged from those cases. The govt. should also impose a ban on the distribution of Trisuls and RSS should not be allowed to use Public places for its parade or for its Shakhas. Sir, I welcome the Govt. steps for promotion of Urdu language under article 345 and 347 of the Constitution. Ex-Prime Minister Shri I.K. Gujaral submitted a report in 1975 and later Shri Ali Sardar Jafferi also submitted the report but the provision of ARTICLE of 345 and 347 still remain a written decoration on the Constitution Books. I also welcome the proposal to establish a Commission to look into issues of mionority professional institutions. Sir, the Constitution of India has conferred educational rights on minorities. The education rights of minorities remain from last more that five decades AN ILLUSION AND A PROMISE OF UNREALITY. I would request the govt. to give reservation to the Muslim minority in govt. educational institutions as well. The biggest minority of the land i.e. Muslims scattered throughout the country. As a matter of fact this is the only Linguistic and Religious Minority, which has a special case. Therefore Central Universities can only provide unbiased treatment to them. The affiliation of Minority professional colleges with the Central University will prove to be a right steps in the right direction. Further it will solve many problems which the regional Universities can not solve because of their institution. The govt. must give statutory powers to this Education Commission. Speaker Sir, the uneducated biggest minority of the land will be a liability and a scare on Indian composite society. Educate them they will become an asset and march along with their countrymen in the nation building process. Dr. Gopal Singh Commission in 1992 pointed out that the Muslims and neo Budists are educationally backward. He suggested for special efforts but till now no special efforts have been taken. The problems of Neo Budists has been solved by providing them facilities of SCs. India must have peaceful relation to all the neighbouring countries. Sir, after UPA has come in to power out foreign policy has been put on correct path by reiterating that India’s stand for the legitimate aspirations of the palastine people. Sir, the Sangh pariwar people were openly advocating a Christian, Jew, Hindutva triangle against the Muslim world. The BJP led NDA govt. has totally against India traditional policy for support of palastian cause in their fight against Israeli occupation. In fact BJP Govt. turned into a strategic allay of Ariel Sheron govt. by maintaining a Stoic silence in the face of Israeli atrocities. I hope the Present UPA govt. will initiate measures with like minded nations to develop a positive attitude for a solution the palastinian problem by containing the ambition of Zionist Colonial Settler State this is emphatical the aspiration of palastian people. I take this opportunity to implore upon govt. of India and the External Affair Minister to persuade the United States about the futility of its Iraq’s policy which has been universally condemned especially after the revelation of atrocities in the Abu Gharib Prison and damage done to the Mausolem of Hajrat Ali in Najaf. Peace efforts with Pakistan should continue.